Home » Columns » What's Fresh? » City Chicks Have More Fun! City Chicks Have More Fun! 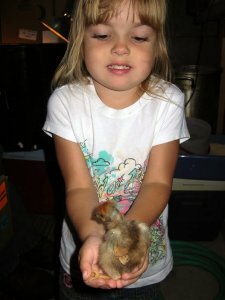 Raising chickens in Omaha is fun AND legal. Admittedly, eating “local” is easier said than done….especially when you live in Nebraska… and there’s a foot of snow on the ground! 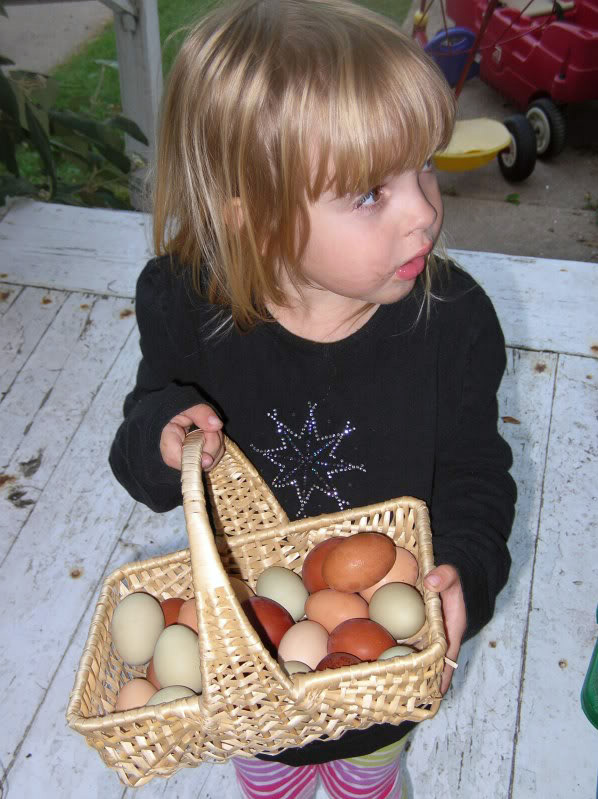 However, there are many foods that can be acquired locally in Omaha throughout the harsh winter months - like eggs! 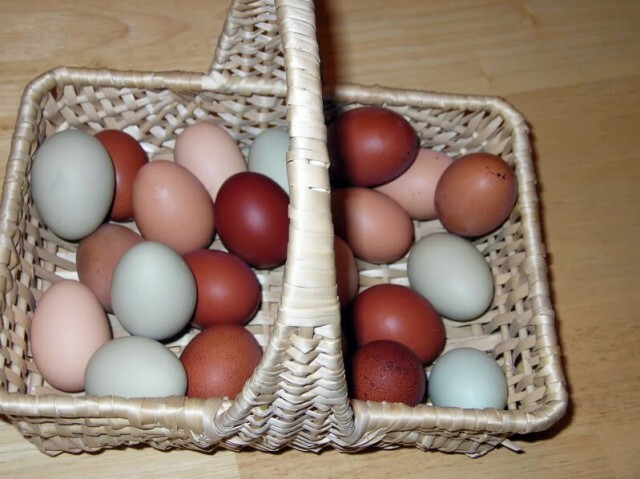 And, if you haven’t already, perhaps this article will persuade you to consider raising some laying hens of your own! What’s that? You live in the city? No problem! It’s perfectly legal to raise laying hens within Omaha city limits (as long as they’re enclosed)! This article was featured on The Weekly Grind, Omaha’s young professional radio program, on January 22, 2011 - Listen to the show! Etta holding a turken at a friend’s houseThe concept of owning chickens bringing “joy” to a person’s life would have made me raise an eyebrow a few years ago. When a neighbor of mine had chickens, I felt it was questionable in an urban neighborhood setting. Flash forward a few years, and I am eating my words. 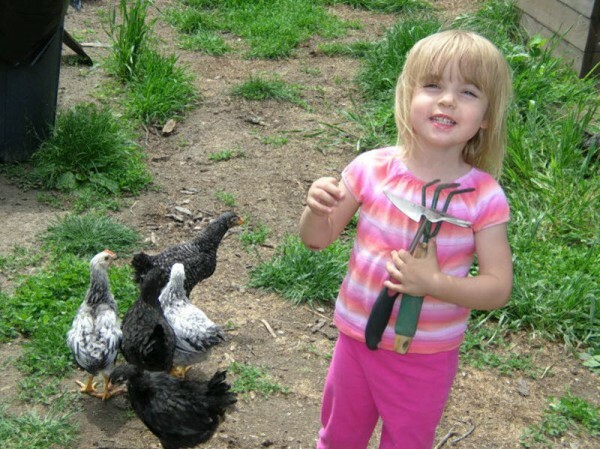 Now when I hear a person mention that they have a backyard flock, I feel an immediate kinship. To me, owning chickens means something. It sends a message that these are people who are doing what they can to be good stewards of their resources in their own way. They want sustainably-grown local foods. It doesn’t get any more local than one’s backyard! They view their property as a tool to be used to increase their self-sufficiency. They may even know that lawns came into being when landed gentry wanted to show they were rich enough to keep a manicured parcel out of production. These fellow “chicken mamas” and “wannabees” cross all preconceived notions of the type of person who keeps chickens. I get a lot of joy from interacting and meeting these new friends. Etta, so proud of our first week of egg collectionIt gives me hope. Another joy of owning hens is the entertainment they provide – have you ever seen a hen lift her petticoats and “run”? Enough said if you have. It is an indescribable vision that can only make you smile. These backyard chickens have not only led me to new friends and made me laugh; they have given me something else - every day they leave me their little gifts of colorful eggs. A day that is not quite going right is quickly perked up by these little orbs. A quick treasure hunt is an easy way to pull my daughter out of a funk, too. We aren’t the only ones that benefit from these eggs either. We love sharing with friends and neighbors. It is our way of spreading the joy - we hope to spread, not only the joy of chicken ownership, but also the joy of providing for oneself. 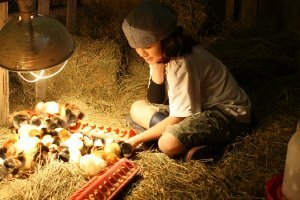 As you can imagine, my visit with the Bodmans got me pretty hyped up for my own chickens, but I must confess that I’m still a little overwhelmed and nervous about the responsibility of raising animals (i.e., keeping them alive and well). Veggies are one thing; chickens…quite another! Sam with baby chicks at Black Sheep FarmsOnce we started farming, we encountered lots of people who told us they wished they could have chickens of their own. Upon doing some research, we discovered that it is completely legal in Omaha city limits, so we’re trying to spread the word. We hope to teach people about chickens, how to take care of them, legalities of urban chickens and how we can offer support of their endeavors. Folks may be surprised to learn just how little effort it takes to raise laying hens. Honestly, they require less care than a dog. They need the basics like any other pet - they need a place to nest, a place to have a dust bath and a place to roost at night. But they are very hardy and not too fragile at all. 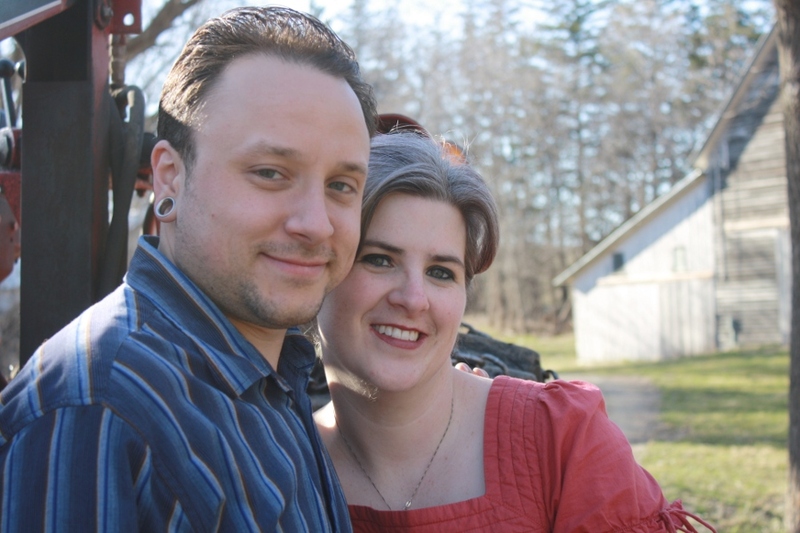 Kelly and Brian Smith of Black Sheep FarmsThere are a few misconceptions that folks seem to have about raising chickens. Most people think it’s illegal in the city, and many people who are against it think that chickens are too noisy, too dirty, etc. Roosters (which are not allowed in the city) are noisy. Hens will occasionally cluck while laying eggs, but I’ll take that noise over a barking dog any day! The biggest surprise to me once I started raising chickens was that you can have day old chicks delivered to your door via USPS. They are extremely fragile (obviously, they’re a day old! ), and we lose some after they arrive, but it surprises me that any can survive that! Chickens are also fun to watch. They’re not the smartest animals I’ve encountered, but they are entertaining. If you live in Omaha and you want to raise chickens in your yard, there’s not a whole lot stopping you. I think the biggest disadvantage city dwellers face is… neighbors. In our class we will cover how to deal with this issue, but if you encounter a neighbor who is dead set against it, you will have problems. Another obstacle is predators. Many people assume that because they are in the city, they won’t have predator problems. Unfortunately, there are just as many predators in the city. The neighbor’s dog or a raccoon can wipe out your chickens and destroy a coop or fence in a matter of minutes! We’re offering this class to equip folks with the tools they need to begin their urban chicken experience. At the very least, you do need to contact the health department, as a permit is required. And before you invest in a coop and birds, it’s a good idea to talk with your neighbors so you won’t have any problems once you begin. Thank you for sharing this! I love chickens and we live on a farm and STILL don’t have our own yet! It is really only because my hubby and I differ about the housing: I want a moveable ark to shift over the field so that I don’t have to clean out a roost, and he wants a large hen house … I think’ll just have to build my own ark! What fun! We keep chickens in our back yard too! We were the first in our neighborhood to have them 5 years ago. I know we raised a few eyebrows too, but now 5 other families are keeping chickens in their back yard too! Great post! And you’re right… it’s just another small step we can take to be more self sufficient! You might like Mary Jane’s Farm Magazine too! My sister’s raising chickens at her home in Portland. She’s so devoted to the project that even after she cut the tip of her finger off trying to make a coop with a circular saw, she didn’t give up. 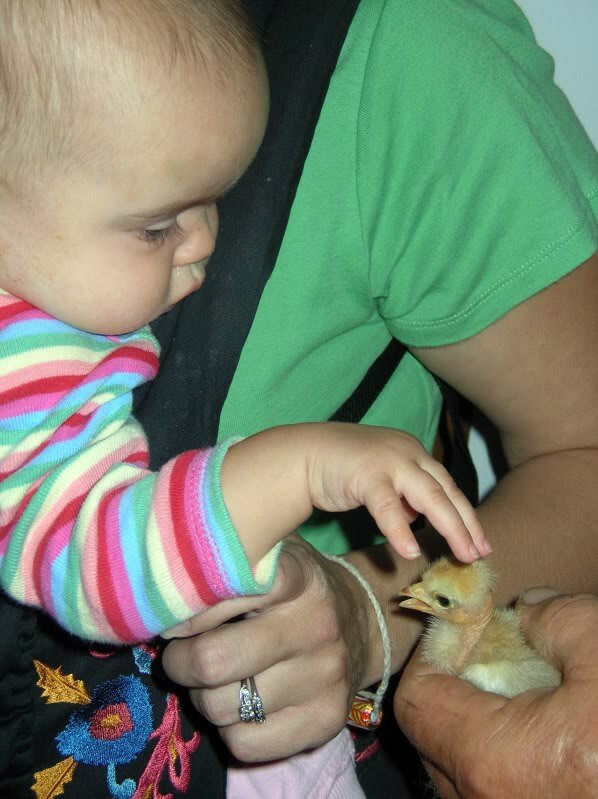 With nine-and-three-quarters fingers, she loves her little chicks. I did imagine it was illegal to raise them in Omaha city limits, but now I’m interested to look into this further. Thanks for the article. Future Chicken Mamas should also check their local HOA’S (homeowner’s association) to see if they can raise chickens within their neighborhood itself. It might be legal in Omaha, but some HOA’S won’t let you have a vegetable garden either. Also, do your research and if the city says its a go, get the coop built before you get any chicks. 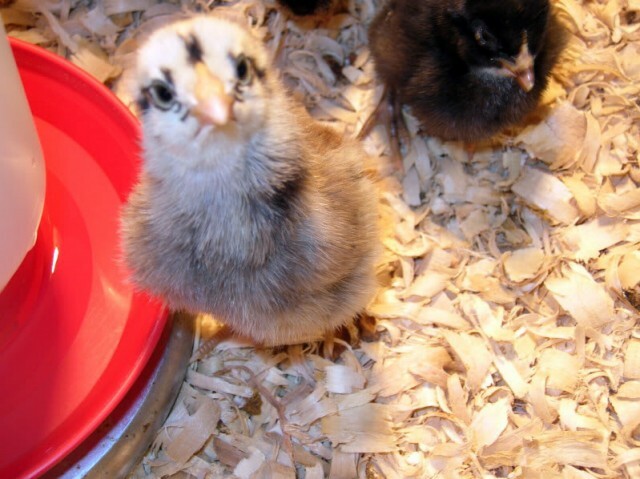 Baby chicks last only so long in the house…….before you get fed up with the smell. We love chickens. Do you think 4 chickens would get approved on 156th and pacific? We can get a chicken coop for 4. thanks! Letting Go of Processed Food: Challenging, But Worth It! Homemade Preserves – Not Just for Grandma Anymore!